Day 1: Change light bulbs. It’s easy to forget about all the bulbs that have burned out over the years. You want your home to be as bright as possible. Day 2: Baseboards. Use a damp cloth and wipe down all baseboards. They say following a wipe with a dryer sheet will help reduce future dust build-up. Repair and touch-up paint any damage. Day 3: Get some boxes and duct tape. A big part of the adventure you’re about to embark on involves reducing clutter. An investment under $100 will get you proper packing supplies and reduce your stress. Better yet, consider Frogbox – re-useable boxes that won’t fall apart. Day 4: Take down curtains and drapes, clean them and decide if they should be re-hung. Natural light can be a big selling feature! Day 5: Tackle the bathrooms. Clean every sink, tub and toilet. Re-caulk if needed. Invest in some new white towels for display only. If your toilet seat, shower curtain or bath matt look tired and well-used, replace them. Day 6: Spruce up the kitchen. Remove everything from the cupboards and fridge and wipe them out. Don’t cram all your dishes and food back in, you want to convey that your kitchen has enough storage for the Buyer’s stuff. Remove your blender/Kitchen Aid mixer/toaster/bread machine from the counters – you want the counters to be as clear as possible. Day 7: Next up: create an oasis. The bedrooms should be inviting, and that means more cleaning and decluttering. Pack up out of season clothes to show Buyers how spacous the closets are. Day 8: Tackle the living room. Clean the sofa and chairs and invest in some new throw pillows. Hide the magazines and all the clutter that has accumulated. Hide the wires from your TV/stereo/speakers. Day 9: Make your dining room look like a place someone might actually want to eat in. Declutter the piles of stuff that have accumulated on the dining room table. Clean up the hutch. Lay out a new table cloth to hide an old table. Day 10: Clean the gutters and the roof. Piles of pine needles and debris scream "high maintenance". Day 11: Tackle closets and storage areas. Much as we’d love to say that you can cram all the stuff you don’t want on display into your closets, the truth is that Buyers will open your closets. They’ll look in your cupboards. The last thing you want is for Buyers to think there isn’t enough storage in your home, so take the time to pack away what you don’t need in the immediate future. Day 12 + 13: De-clutter, organize and clean the basement and garage. Whether your basement is finished or just a storage area for extra stuff, you’ll need to invest the time to make it look as spacious and clean as possible. What a great two days to rid yourself of all that stuff you never use. Day 14: The entrance. Most Buyers will have an emotional reaction to your home within 15 seconds of entering it. You want your entrance to be clean, de-cluttered and inviting. You won’t be wearing all your shoes and coats while your home is for sale, so be disciplined and store things away. Day 15: Clean the microwave and the oven. Day 16: Tackle the little stuff that you’ve been avoiding repairing including the leaky faucet, creaky door hingles, the unused picture holes in the wall, etc. If you aren’t handy yourself, bring in a handyman to take care of it. We of know some good ones! Day 17: Paint touch-ups and re-painting. A fresh coat of paint is one of the cheapest ways to freshen up your home. Bold colours are bound to be a turn-off to some Buyers, so to appeal to the most people possible take the time to re-paint that red bedroom and blue bathroom. Light colours will help small rooms look bigger. Day 18: Clean your windows inside & out. 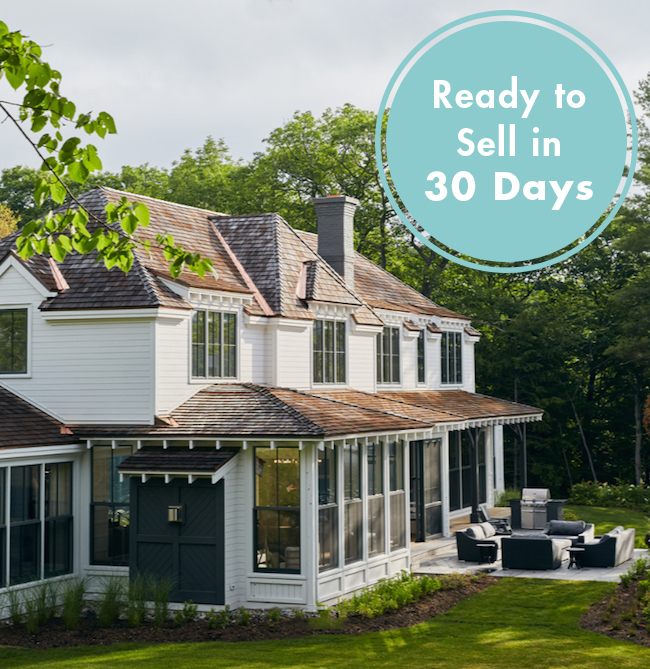 You may not see it, but those years of rain, pollen and debris will be seen by potential buyers. We can recommend a window cleaner for your area! Day 19: The front yard Curb appeal matters. Stand on your street and take in your front yard: what do you see? Clean the scuff marks off the front door and touch-up the chipped paint or give it a fresh coat. If you have a front porch, make it look inviting and not just a receptacle for more stuff. Invest in some colourful seasonal plants near the front door. Day 20: The backyard. Pull weeds, sweep the deck and clean the yard! Wipe down patio furnuiture and create a relaxing oasis. Keep a clean path around the home. Day 21: Pressure Wash. Make your aged pavement and wooden deck look brand new with a deep clean. Clean the siding if necessary. Day 22: Don’t forget about the floors. Unless your carpets are brand new, you’ll want to have them steam cleaned. You’ll be amazed at what a difference it makes. You’ll need more than a Swiffer to get into all the corners and cracks. If your floors are scratched, there are some great products out there to make them look almost-brand-new. Day 23: The walls and doors. If your walls and doors are scuffed, buy some Magic Erasers and go to town. You’ll wonder why you didn’t do it sooner. If your art needs an update, now’s the time to do it too. Day 24: The final clean. By now you’re probably exhausted. While you can do this final step yourself, we always like to bring in professional cleaners who will make sure to clean every corner. Day 25: Make plans for the dog/cat/ferret/hedgehog during showing. We love our pets, but prospective Buyers won’t appreciate the distraction. Make a plan to get your pets out of the house: Doggie daycare? Grandma and Grandpa? Multiple walks? Day 26: Make your house smell good. If you’re a dog owner, wash any couches, beds and surfaces where the dogs sleep. Tuck the litter box away (and clean it twice a day while your home is on the market). Use Febreeze on EVERYTHING. Wash throw rugs, bedding, blankets, etc to keep the home smell fresh. Avoid strong air fresheners. Day 27: Dust EVERYTHING! Clean the ceiling fan blades, top of the refridgerator, back of the toilets, window sills and blinds. Leave no surface untouched! Day 28: Make it less personal. Hide all the bathroom toiletries you have on display. Remove the fridge magnets, photos and reminders. By depersonalizing the home, Buyers will find it easier to image living there. Walk through every room in your house. If what you see helps Buyers get to know you as you, remove it. Day 29: The final once-over. You’ve worked hard, and now it’s time to step back and admire your work. How does it look? Do you see anything that might distract or turn off a Buyer? Take one final walk through all the rooms and adjust as necessary. Day 30: Call the Grant Gardner Team and tell them the house is READY! Intimidated? Don’t be! We’ve helped clients accomplish everything on this list in as little as four days during the Christmas season. If you’re in the market to sell, the sooner you call the Grant Gardner Team to help, the better.